The new CAESAR layout is set to be unveiled Monday. In addition to the layout, the update will include new mobile-friendly features. Northwestern’s student information portal, CAESAR, will be redesigned this weekend to include a new layout and mobile-friendly features. 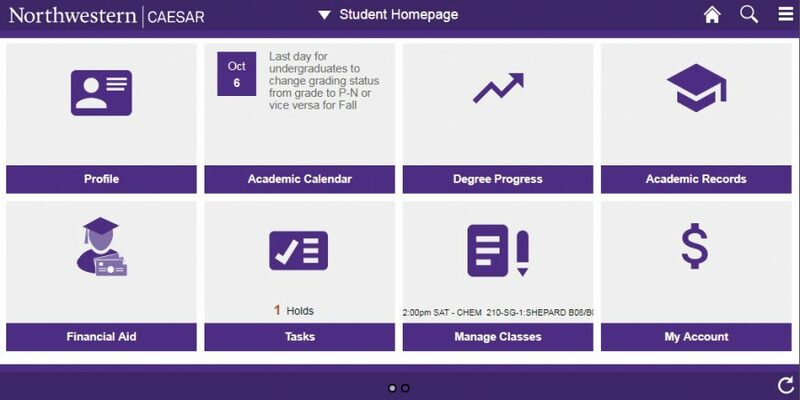 The revamp will improve system navigation and make the “View My Grades” and evaluations sections easier to view on mobile phones, director of student enterprise systems Ann Dronen said. One of the main motivations for these changes came from student feedback, she said. “We do an annual survey to students and this has been pretty high on the list of complaints … so we took that to heart,” Dronen said. Dronen said major updates like this one typically happen every two to three years, but periodic changes and other minor improvements are also made throughout the year. Student Enterprise Systems involved the community in the changes and used student focus groups to help make some design-related decisions, Dronen said. She added that the department also talked to various other departments, faculty and staff about how to improve the widely-used system. To upgrade the system, Dronen said CAESAR will be unavailable from Thursday at 5 p.m. through Monday at 8 a.m. Canvas will still be available to students during this time. Senior systems analyst Jennifer Bivens, who helps conduct the annual student survey, said the new mobile-friendly features are a sign of future changes. Though students expressed interest in using CAESAR on a mobile device, survey results indicate most currently use the desktop version, she said. “We have to see how students start to use mobile devices for registration, for example, and then respond to that with this year’s annual survey once this is released,” Bivens said. Dronen said while this update is a good step forward, many parts of CAESAR will still not be mobile friendly. Student Enterprise Systems plans to add more mobile-friendly pages in the future, she said. Weinberg sophomore Uma Jacobs said she wished additional issues had been addressed with this upgrade, namely the Multi-factor Authentication system — implemented last year — which requires a mobile phone to log into CAESAR. Despite the difficult login process, Jacobs said she welcomes the layout and organizational changes. “The layout changes are good because … there’s like a hundred buttons and it’s really threatening, so I think they could do better with that and make it easier,” Jacobs said.